Thank you, Michael, for the translation of the birth record. Yes, that first letter of the place threw me off because it looks like "F' not "P", but the rest of the word looks like ?entzken. I have other records that showJacob was living at Pentzken estate, so that is probably what it is. I have a specific question about a record I am attaching. It is a death record for Christian Radziminski son of Michael Radziminski. It is entry #12 on the page. What are the two words at the end of the first line, right after "Michael Radziminsky"? It looks to my eyes like: "adal:Lub". I can't tell if that is an abbreviation for something or if it is the beginning of a word that continues on the second line. Can you make it out? and Merry Christmas to you and an abundance of blessings in the New Year! The first of the two words after Mich. Radziminski’s name I read as “adel:” short for “adeliger” or noble. From the context I would assume that the second word begins in the first line and is continued in the second line till the first insertion “cath: Rel:” before “Sohn”. But unfortunately I cannot tell what the second word means. 2. Does "cath: Rel:" mean they were Catholic? That would surprise me because in all other records I have found they were evangelical. Thank you again! And, Happy New Year to you as well. I had a second look at the document you provided and compared your entry with the other entries on that page. If you look at the last entry of the page you will find a quite similar structure and probably also a similar wording: “child’s name, father’s name, father’s status and religion”. The status is provided as "adel: Einsaaße cath: Relig:". I would assume, that in your entry the same words are used, so Michel. Radziminski was also an "adel: Einsaaße cath: Rel:". Regarding the term “adeliger Einsasse” you will remember our discussion from summer 2017. So to answer your questions: for my understanding there is no “Lubicz” mentioned in the entry and yes, this is an entry for a person of Catholic religion. In need of translation of the attached record. I've done well with Polish translations but don't have a clue about what this one says. This record is for my great-great grandfather. 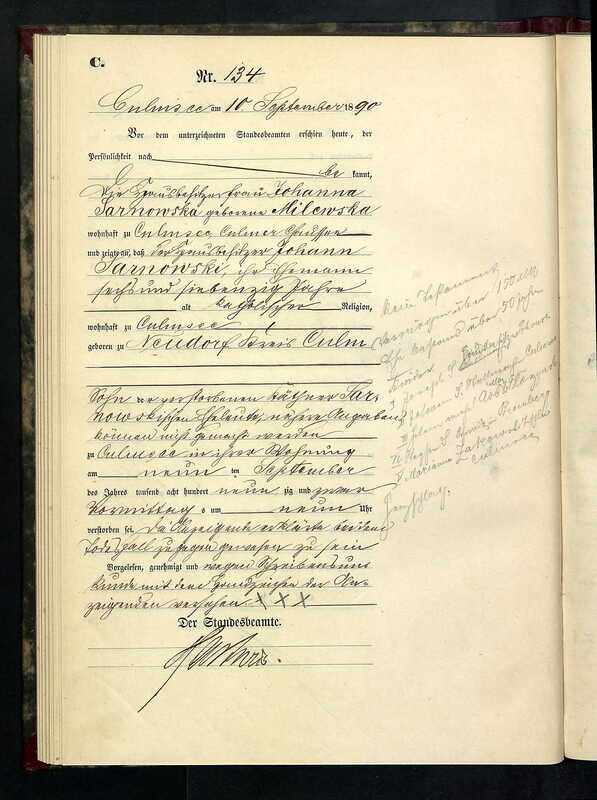 Not sure why there is writing in the right margin but looking for translation of the official document. C. [indicating it’s a death record] No. 134. Culmsee [Chełmża], on September 10, 1890. Before the undersigned registrar appeared today, of known identity, the house owners wife [die Hausbesitzerfrau] Johanna Sarnowska, born Milewska, residing in Culmsee, Culmer Chaussee [literally: the causeway to Culm], and gave notice that the house owner [Hausbesitzer] Johann Sarnowski, her husband, 76 years old, of Catholic religion, residing in Culmsee, born in Neudorf [Nowawieś Chełmińska], county of Culm, son of the deceased spouses cottager [Käthner] Sarnowski [Sarnowskischen Eheleute], details cannot be given, in Culmsee in her home on September 9 of the year thousand eight hundred and ninety at nine o’clock p.m. had died. The notice giver declared, that she knows about this death from own experience. Read aloud, authorized and marked with the sign of the notice giver, because she cannot write. The comment on the right was added later. In a nutshell it says: no will, a property of 150 Mark, the marriage existed for more than 50 years, and gives the names of five children. The second page of the document was not provided. I have the second page of the document, but wasnt sure if it had any relevance. 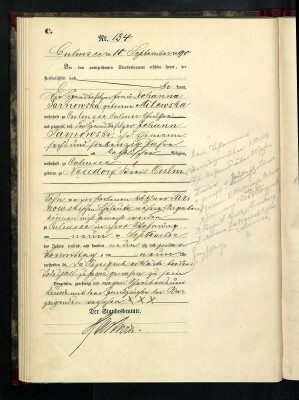 The second page shows name, status, age and residence of the witnesses, the usual clause that groom and bride are married now and the signatures. No new information about groom or bride. 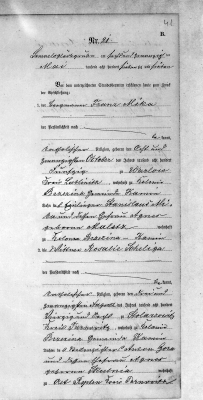 Hello, I would greatly appreciate a translation of this marriage document. Thank you for all you great work. Please find attached the translation of your document. Registry office Stuttgart-Bad Cannstatt No. 215/1947. The welder [it’s written “Schweizer” i.e. 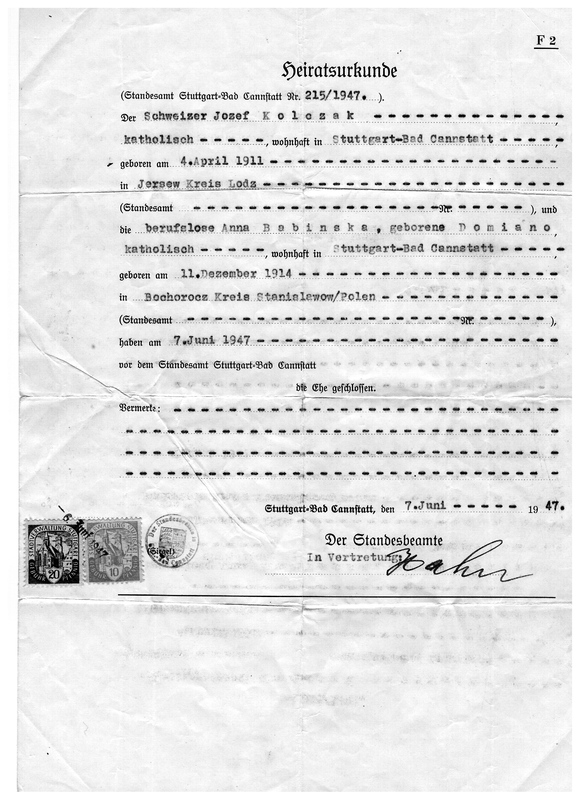 Swiss citizen but I assume what was meant is “Schweißer”] Josef Kolczak of Catholic religion, residing in Stuttgart-Bad Cannstatt, born on April 4, 1911 in Jersew, Kreis Lodz [might be Jeżew in the county of Łódź] [registry office and no. are not provided] and Anna Babinska, without a profession, born Domiano, of Catholic religion, residing in Stuttgart-Bad Cannstatt, born on Dezember 11, 1914 in Bochorocz, Kreis Stanislawow / Poland [might be Bohorodczany in the county of Stanisławów] [registry office and no. 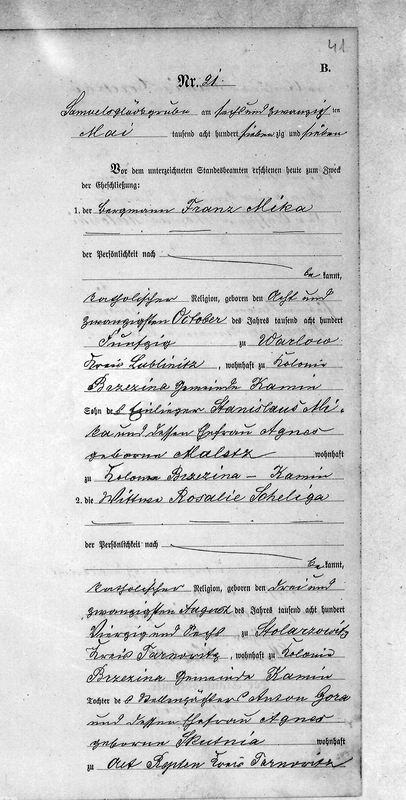 are not provided] have married on June 7, 1947 before the registry office of Stuttgart-Bad Cannstatt. Stuttgart-Bad Cannstatt, on June 7, 1947. The Registrar. As representative (signature).